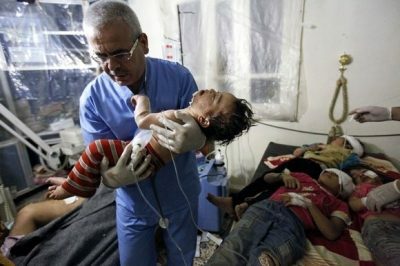 The Representatives of the World Health Organization (WHO) said the hospitals in Syria are now in a critical situation because of Western sanctions. The WHO’s representative in Syria, Elizabeth Hoff, said there aren’t enough equipment and replacement parts for X-ray, ultrasound machines, endoscopes and other scanners in the hospitals because of restrictive measures against the republic. According to the World Health Organization’s research, the equipment for providing diagnostic care in fact is not in a serviceable condition or some cases completely unavailable. In addition, the Syrian Ministry of Health reports there is a catastrophic shortage of many drugs, in particular, immunosuppressive drugs and oncology treatments. To be noticed is that the European Union extended imposing the sanctions against Syria until June 1, 2018. The updated ‘black list’ includes 240 individuals and 67 legal entities. Current sanctions against Syria will be extended, for instance, and will also affect the oil embargo, investment restrictions, an assets freeze of Syria’s Central Bank inside the EU, and prohibition of sale or supply of equipment and technology to the country. Meanwhile, according to the rector of the Chemistry and Pharmacy Institute at the University of Aleppo, Mahar Harman, only friendly to Syria countries are trying to help. Apparently, the Western countries are not ready to realize that civilian population of Syria first of all suffers due to the shortage of medicines, medical equipment and scanners. There aren’t enough polio vaccinations, insulin, painkillers and anti-inflammatory medications and other life-saving medicines. Thus, the EU sanctions against Syria only aggravate the humanitarian catastrophe in the country.